A Writers Night Out event at Portsmouth Book & Bar in Portsmouth, N.H. This week, a new bookstore opened in Providence. Riffraff, a bookstore-bar in a former mill building created by co-owners Tom Roberge and Emma Ramadan, aims to be a hub of the evolving Olneyville neighborhood. A half-dozen years ago, this news might have drawn serious skepticism. Who opens a brick-and-mortar bookstore in the digital age? People don’t read books, the thinking went. They read texts and social media. If they do need a book, they order it on Amazon. Starting in the mid-1990s, bookstore closures became commonplace. Even the big-box booksellers that had pushed so many of the country’s smaller bookshops to the brink — Borders, Barnes & Noble — were struggling in the face of the Amazon onslaught. And then there was the advent of the e-reader. Retailers and publishers panicked as the cheaper ebooks appeared poised to kill off demand for dusty old real-world books — or “treeware,” as they were sometimes mocked. Book lovers have been hearing about this happy turnaround for some time. Now there’s a Harvard Business School study to confirm it and provide a few theories. 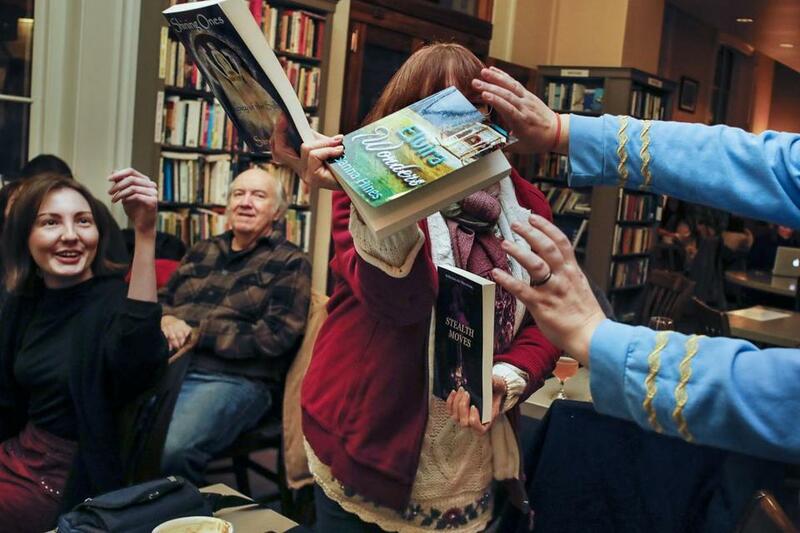 Author Sanna Hines of Maine (center) got help holding up her books to get feedback on the cover art at the Book and Bar "Writers Night Out'' event in Portsmouth, NH. Ryan Raffaelli is an associate professor at HBS specializing in organizational behavior. He spent the past five years immersed in the book world, and he’s come out of his deep dive with some thoughts about the genuine social value of traditional neighborhood bookstores and how they’ve changed their own fates. The full study won’t be published until next year, but in a newly released overview, Raffaelli notes what he calls the “three C’s” of his findings: community, curation, and convening. 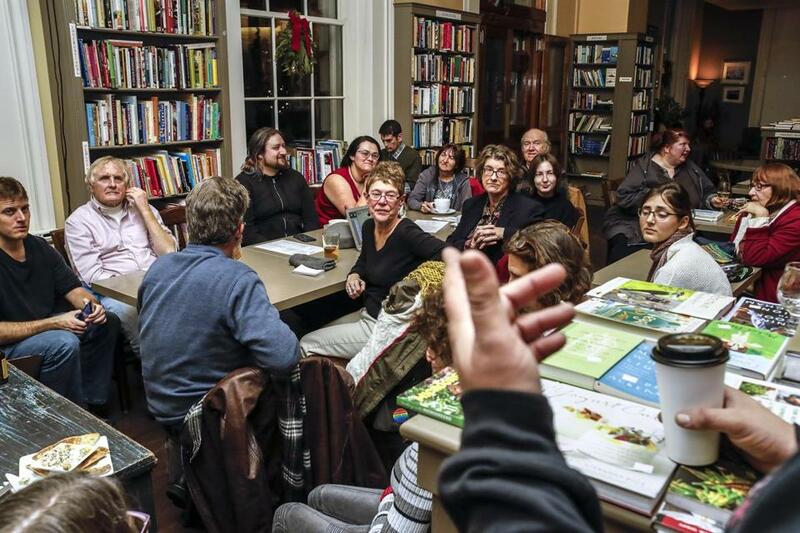 Independent bookstores early on embraced the community-oriented “localism” wave that has inspired the proliferation of craft brewers, farmers’ markets, and the like. Small bookstores carefully curate the books they sell to reflect their clientele’s interests and concerns. And in recent years they have repositioned themselves as “intellectual centers,” hosting events and convening people and ideas in shared spaces. In other words, booksellers have learned to adapt to the vast changes in their own industry. Prior to books, Raffaelli studied the Swiss watch industry, which has overcome the arrival of digital watches in the 1970s by renewing an emphasis on craftsmanship. Swiss watches and independent booksellers are two examples of what Raffaelli has termed “technology reemergence,” when an industry collectively reinvents itself by doubling down on the core values of its own past. Steve Fischer attributes much of this revival to the dynamic folks who choose to own, manage, and work for independent bookstores. He’s the retiring executive director of the New England Independent Booksellers Association (NEIBA), the ABA-affiliated regional nonprofit trade association. “I think we’re doing the right thing,” he says. There has been some upheaval in recent years in the local book world, with new owners taking over at mainstays such as Harvard Book Store and Bunch of Grapes on Martha’s Vineyard. Across New England, a few longstanding stores have closed, Fischer says. But many more have opened, from Belmont Books in Belmont and Jeff Kinney’s An Unlikely Story in Plainville to Print in Portland, Maine. Papercuts J.P. has quickly become a Jamaica Plain institution since opening three years ago. Owner Kate Layte just took over a former shop next door, doubling her tiny, eclectic space to include more book-related merchandise and a dedicated children’s section. After moving into the neighborhood, Layte became infatuated with its literary history, with connections to Margaret Fuller, Anne Sexton, and E.E. Cummings. “It had all these roots, and I knew I wasn’t the only person here reading books,” she says. So she decided to open the kind of bookstore she wanted to shop in herself. Viewed from outside, published and aspiring authors converse at the Book and Bar "Writers Night Out'' event in Portsmouth, NH. A couple of miles away, in another part of Boston, Leonard and Clarrissa Egerton have settled into the new Dudley Square location for Frugal Bookstore, the former Washington Park Mall fixture that the Egertons bought a decade ago from the original owner. After more than a year in their roomy new space, they finally hung their sign outside. “Some of these things take a little time,” says Egerton. The bookstore has always specialized in providing Roxbury residents with “books written by people who look like them,” he says, but they’ve also learned to stock plenty of James Patterson thrillers. To that end, bookstore owners have taken some poetic license with the job description. Riffraff and Portsmouth Book & Bar in Portsmouth, N.H., both serve booze. Shops such as Hello Hello in Rockland, Maine, and the Savoy Bookshop & Cafe in Westerly, R.I., opened in early 2016 in a historic former hotel, sell a carefully curated selection of gifts and crafts in addition to books. Belmont Books recently held a pie-baking contest inspired by pastry chef Louise Miller’s debut novel. Many offer entertainment like open-mic nights or trivia contests in addition to readings and panel discussions. Publishers who were once fixated on the fact that the chain bookstores could move cases of bestsellers, says NEIBA’s Fischer, have come around to the idea that indie booksellers, through word-of-mouth and personal recommendations, can have a big impact on the sales of everything else. The recent rise in independent booksellers has coincided with an increase in overall book sales. For the third straight year, print book sales were up in 2016, with children’s books and adult nonfiction enjoying particular gains — tossing cold water on the notion that Americans have given up on long-form reading. For those in the business, such strong numbers and Raffaelli’s report confirm what they’ve known all along: We may read alone, but readers want community with others who share their passion. 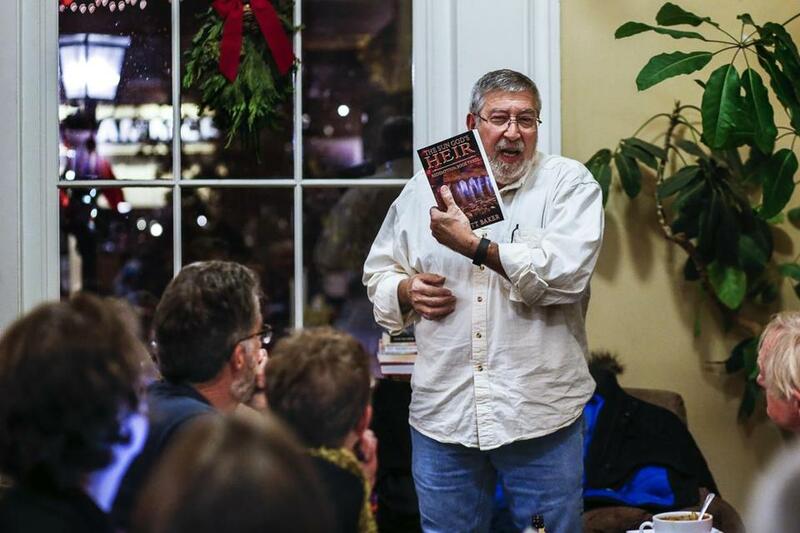 Author Elliott Baker of Durham talks about his book at the Book and Bar "Writers Night Out'' event in Portsmouth, NH.